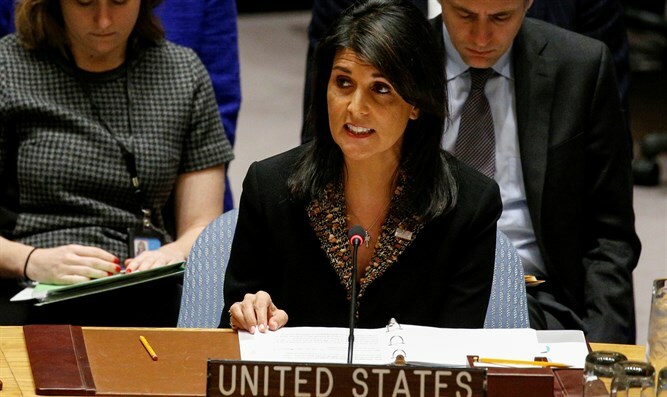 US Ambassador to the UN Nikki Haley addressed a UN Security Council briefing this evening, Wednesday, that dealt with the situation in Syria and the military confrontations on Israel’s northern border over the weekend. On Saturday, an Iranian drone which invaded Israeli airspace was shot down by Israeli fighter jets. The IAF responded to the incursion by targeting the command center near Damascus where the drone was operated. During the airstrikes, Syrian surface-to-air missile batteries fired dozens of anti-aircraft missiles at the Israeli jets. One jet was damaged by a Syrian missile, forcing the pilot and navigator to eject after they crossed back into Israeli airspace. The plane crashed in northern Israel, but the two crew members were recovered by search and rescue teams and evacuated for medical treatment. “On every front of this conflict [in Syria], we find fighters imported by Iran from Lebanon, Iraq, and Afghanistan. When we see the Assad regime starving civilians in eastern Ghouta or pummeling schools and hospitals in Idlib, we see advisers from Iran and Hezbollah helping direct those atrocities. This support for the Assad regime is not new, of course. But the drone flight this week is a wake-up call for all of us. Iran and Hezbollah are making plans to stay in Syria,” Haley said.